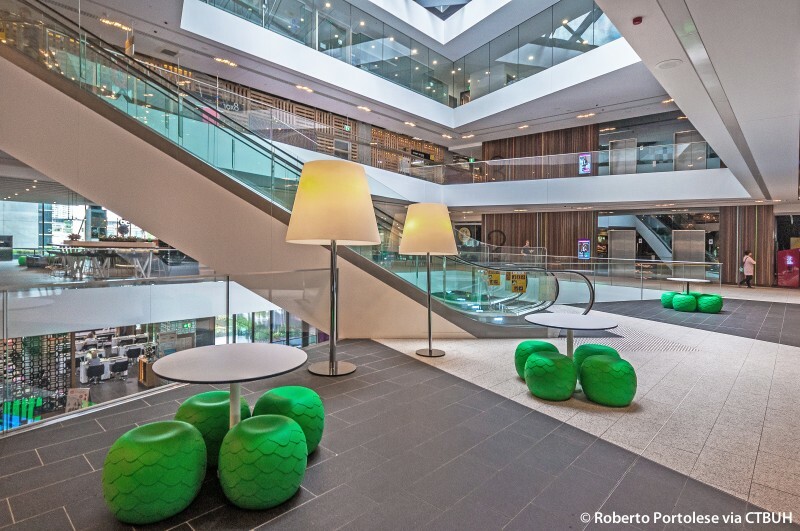 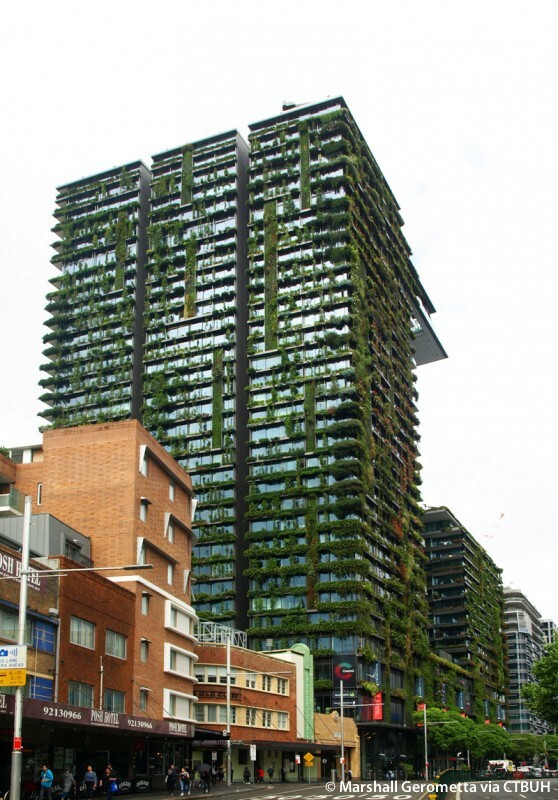 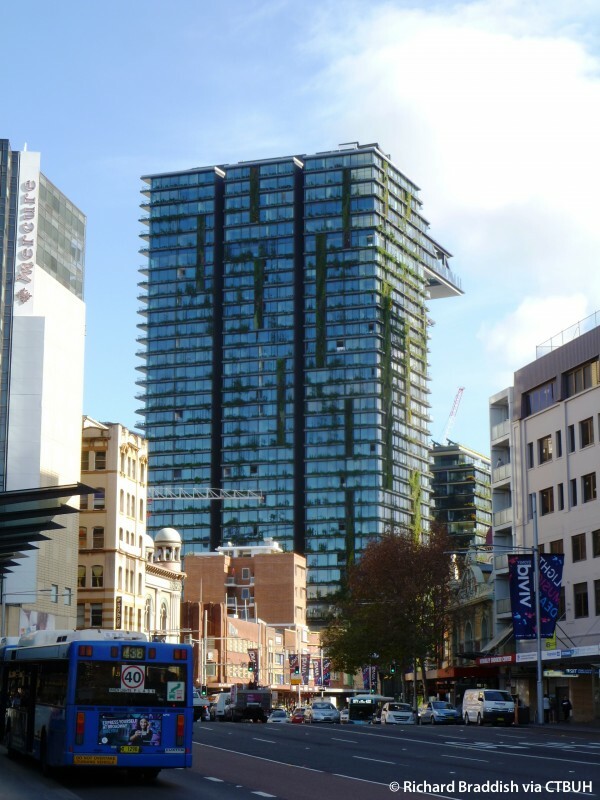 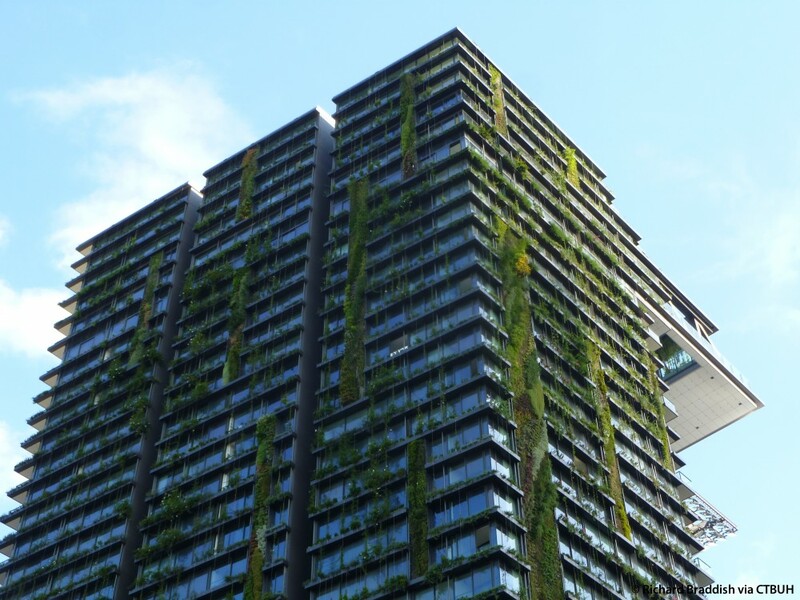 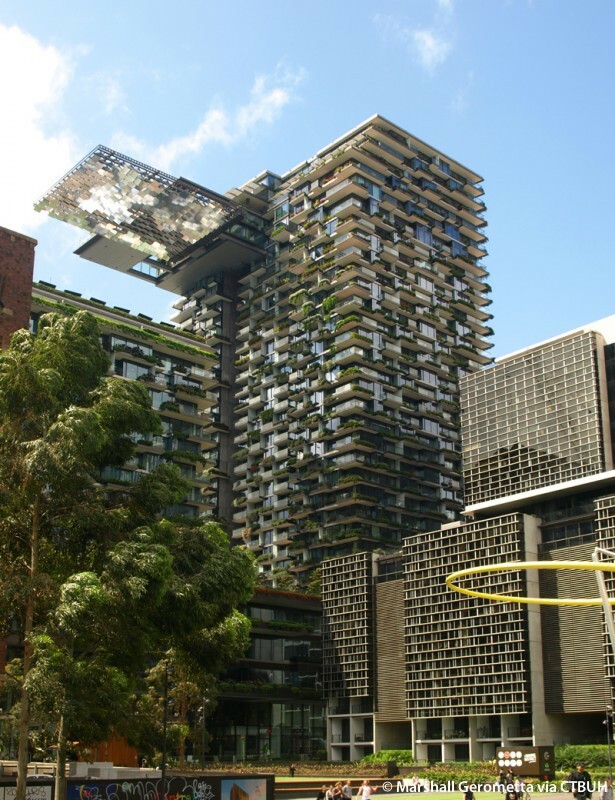 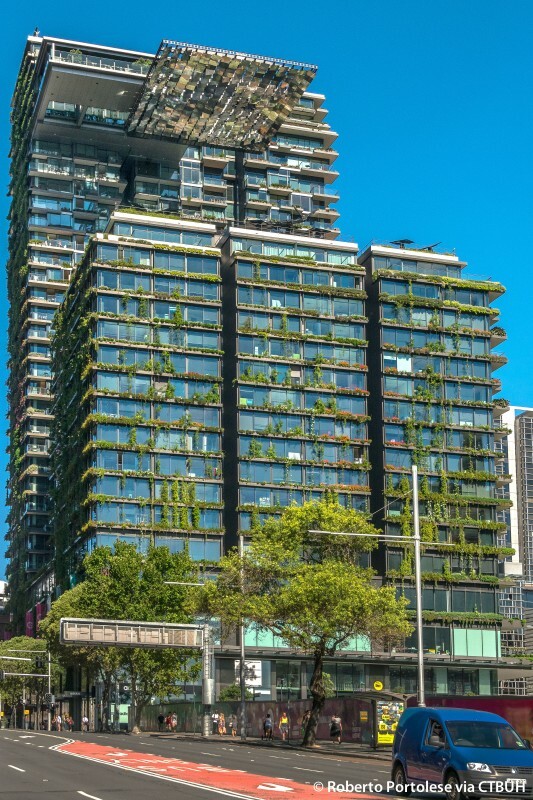 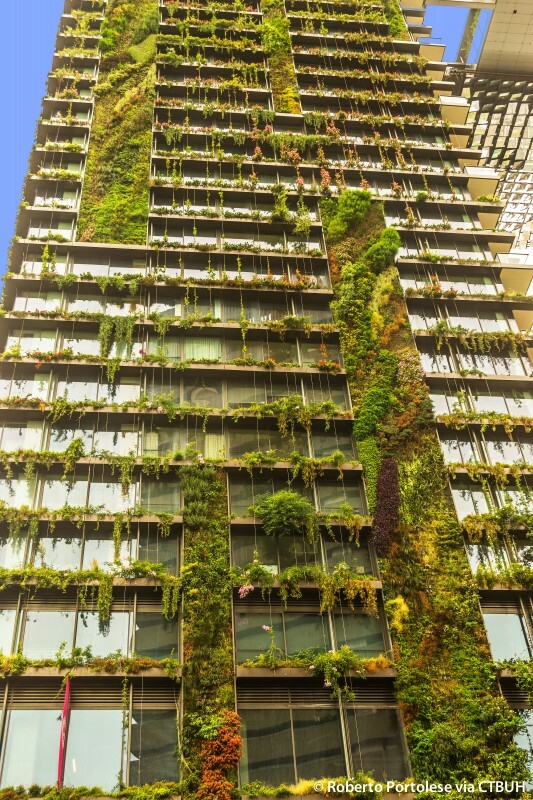 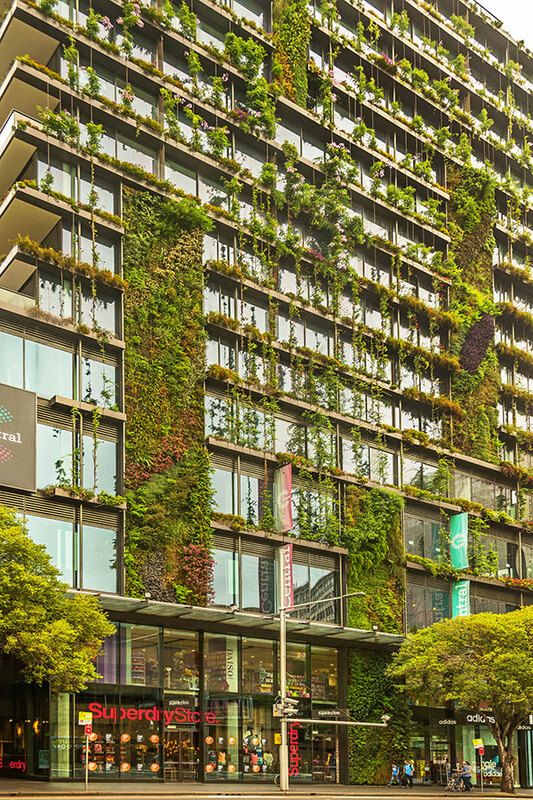 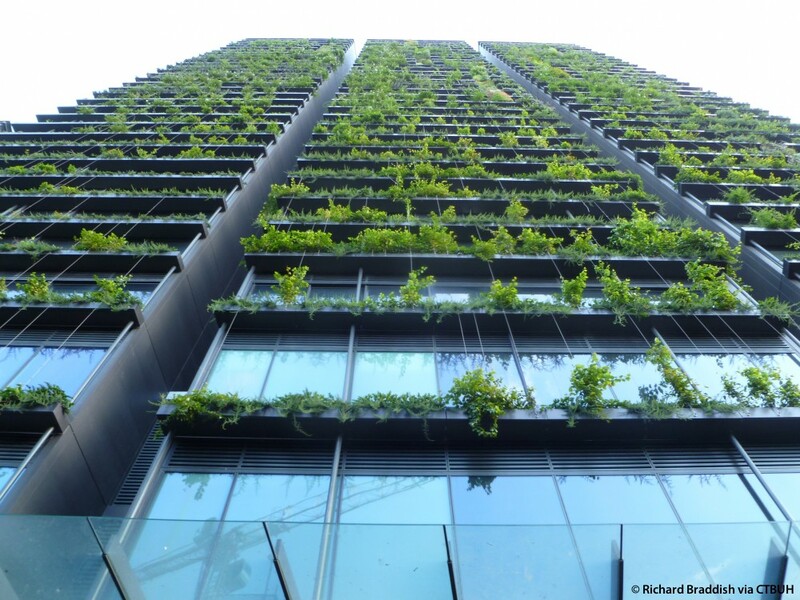 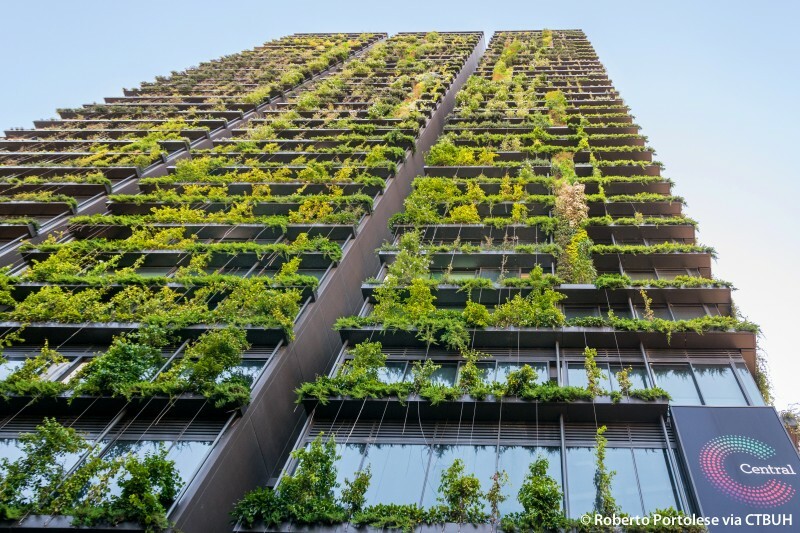 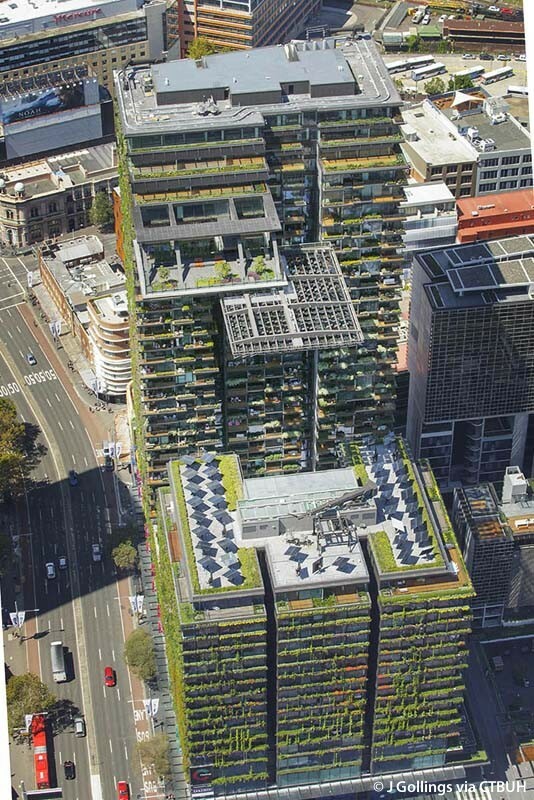 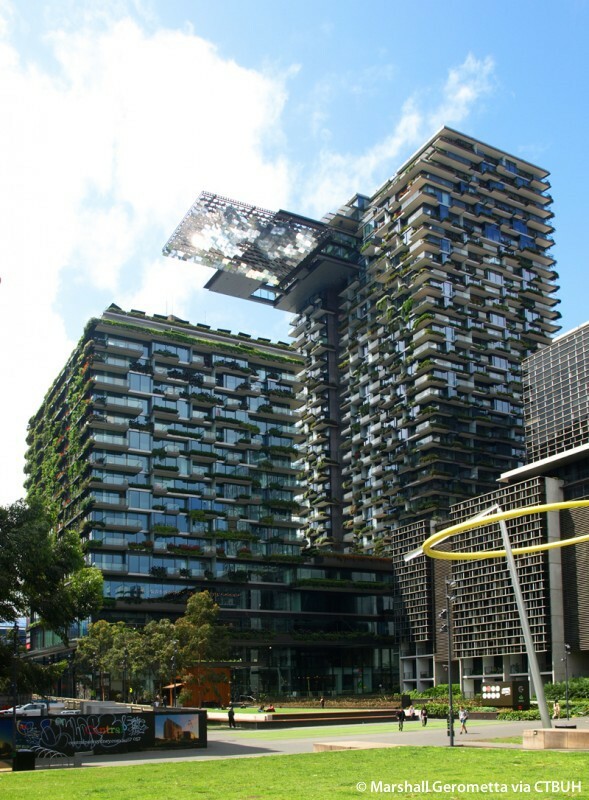 “Greening the City,” the off-site tour for One Central Park (OCP), Sydney, was able to take in numerous perspectives of the building, and to understand it in the context of the larger Central Park development, a mixed-use project constructed on the grounds of a former brewery. 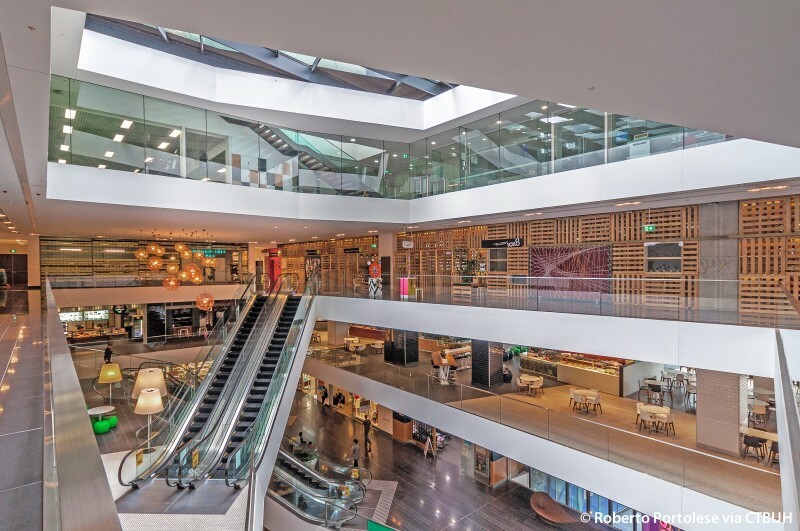 The group met on the third level of the retail podium for coffee and pastries in a soon-to-open movie theater. 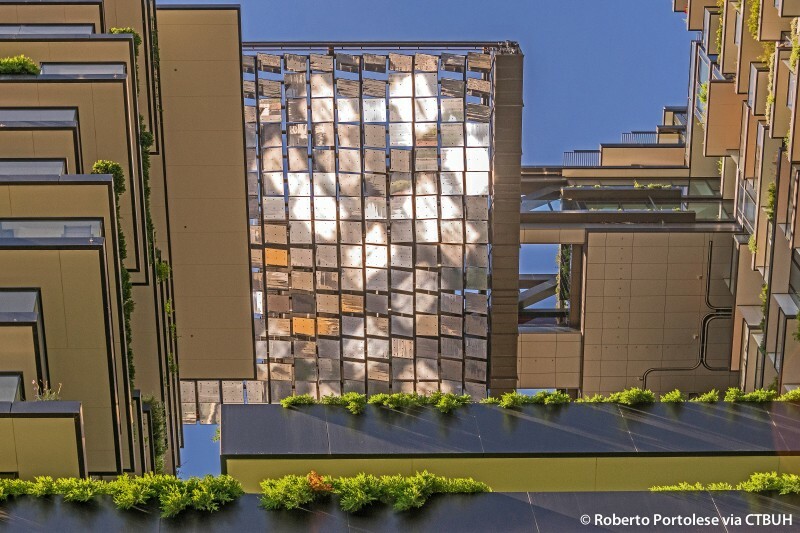 The theater lounge/coffee bar offered views of the planting beds extending out beyond the glass façade, and to the adjacent Central Park beyond. 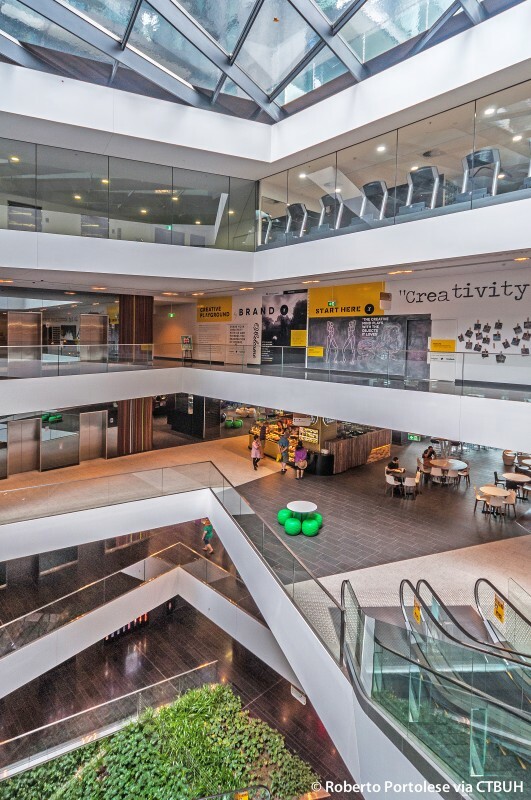 In one of the screening rooms, participants heard from three presenters. 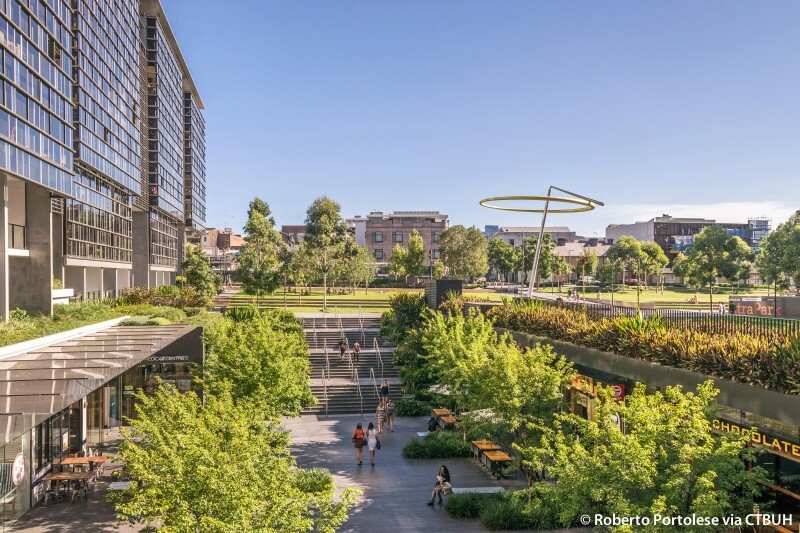 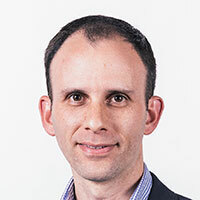 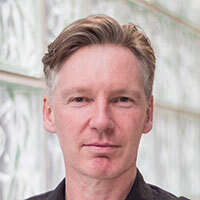 Michael Goldrick, Director of Project Management, Frasers Property Australia, provided the history and context of the overall 5.8-hectare Central Park master plan, for which OCP was designed as a key landmark tower to anchor the overall development. 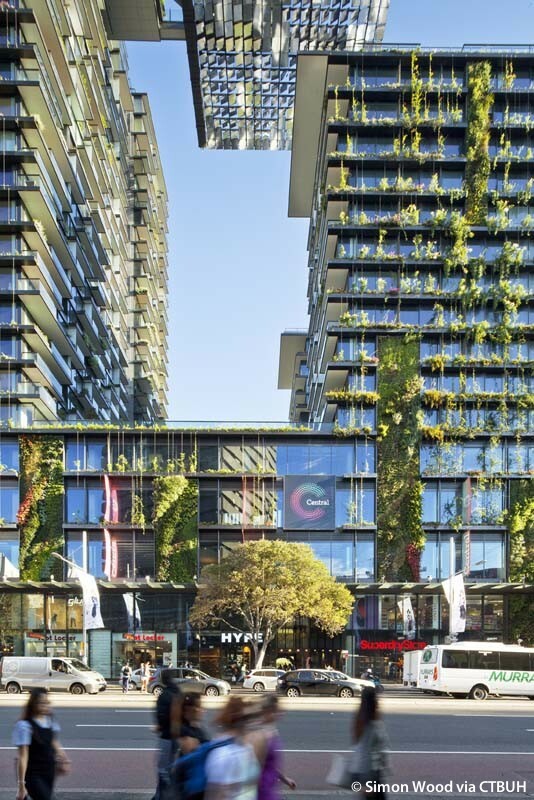 Frasers Property was committed to the highest sustainable standards, with people at the heart of that commitment, Goldrick said. 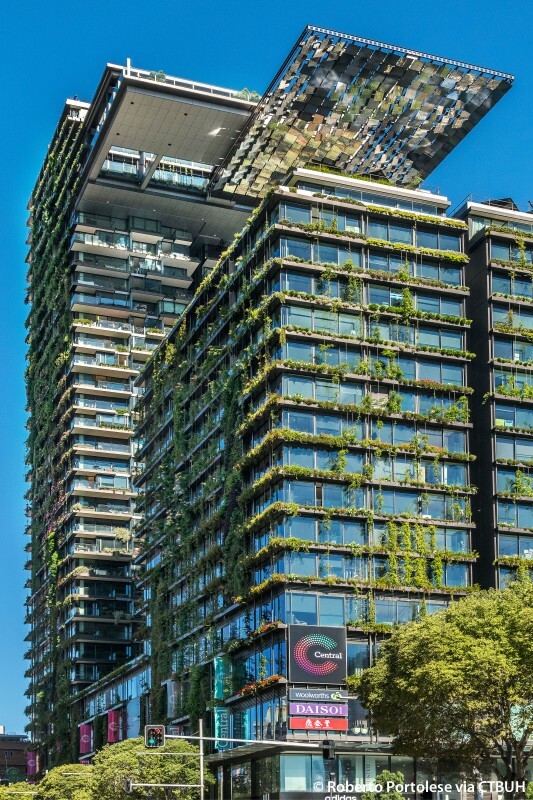 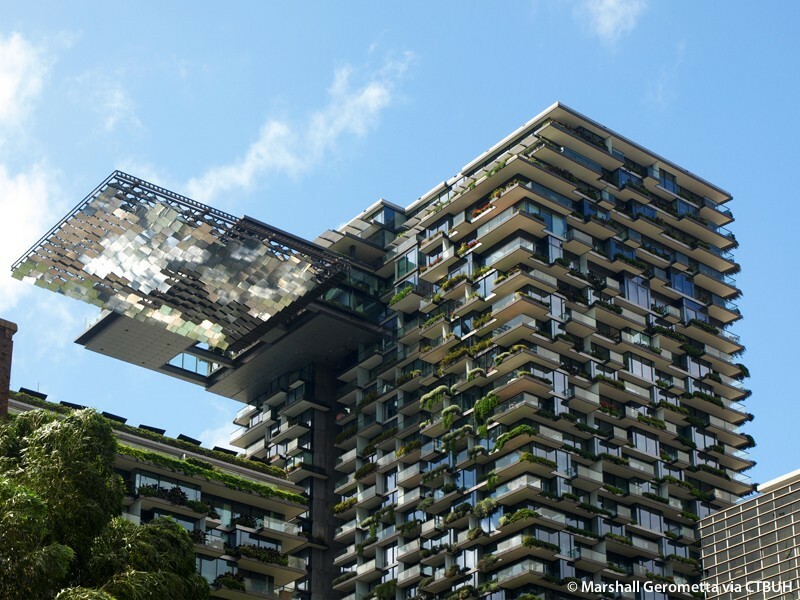 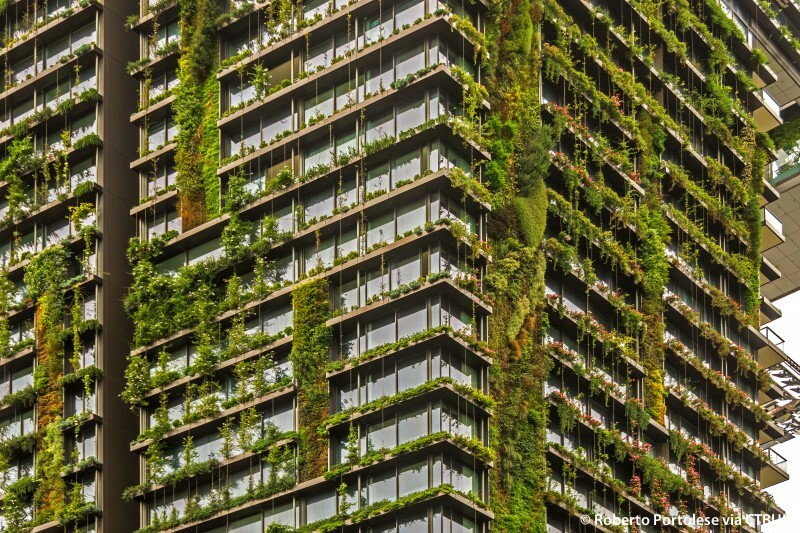 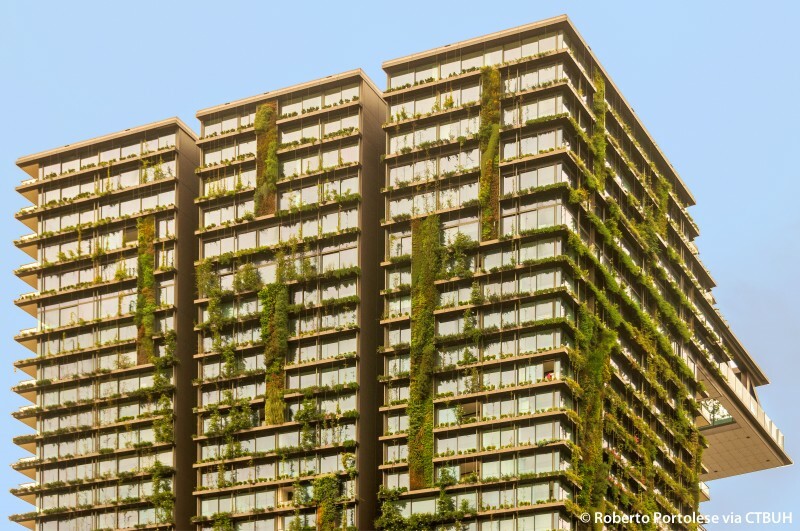 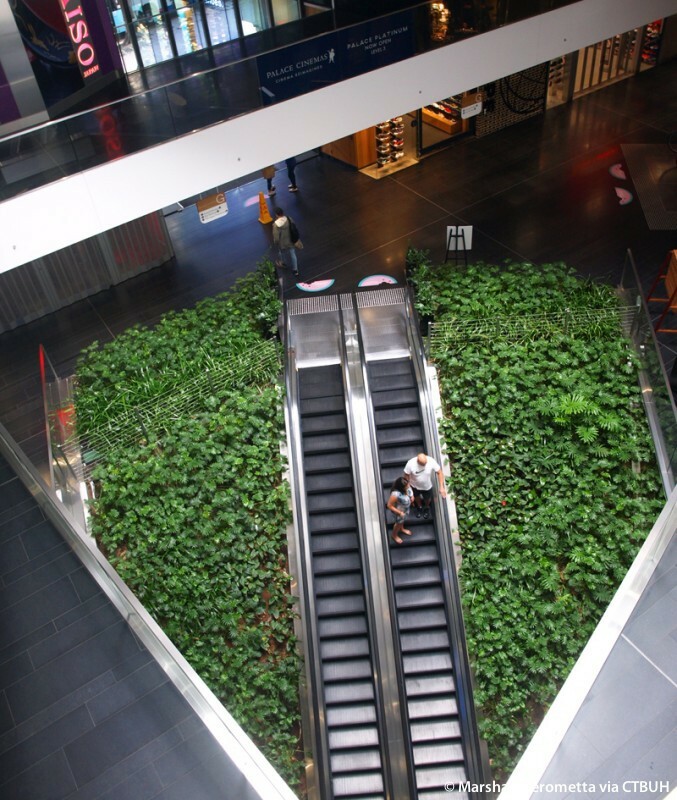 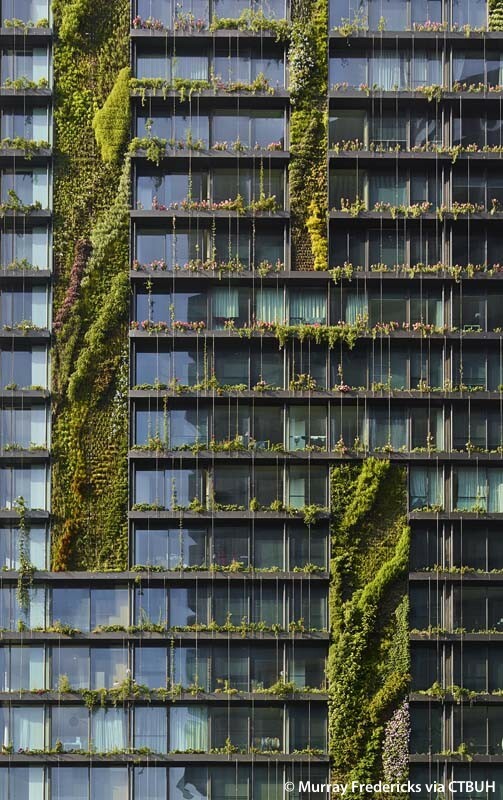 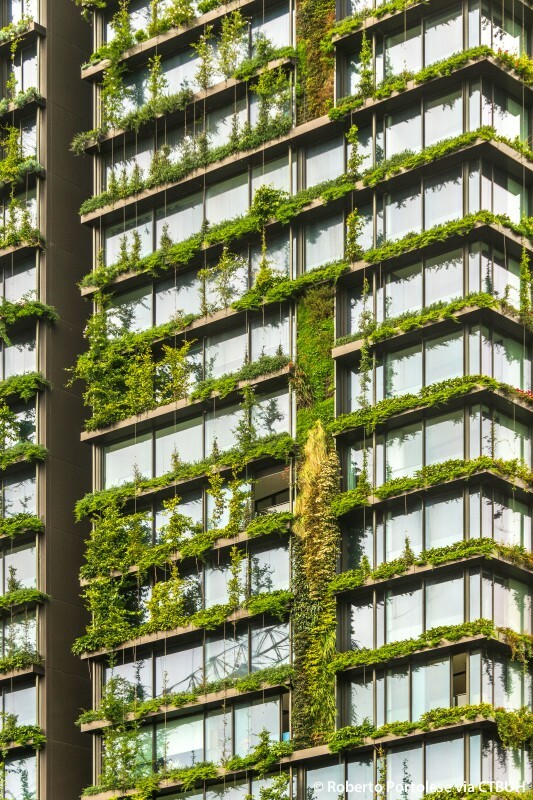 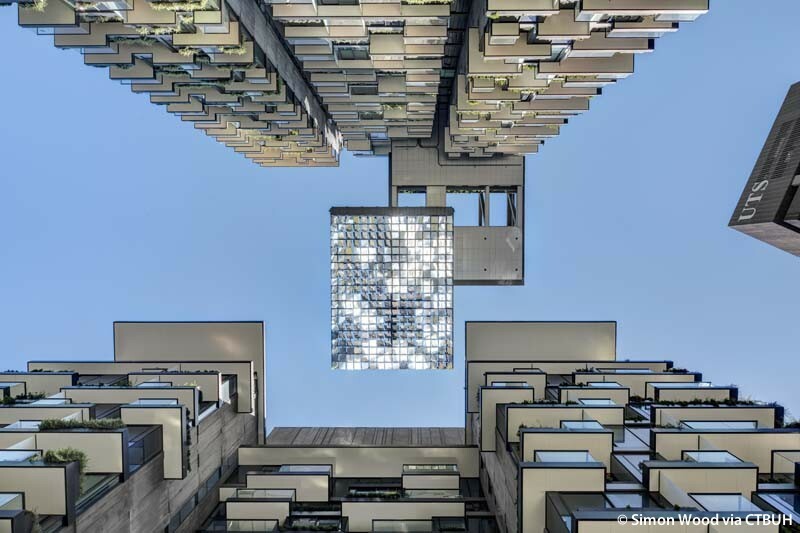 The team was committed to executing Ateliers Jean Nouvel’s design vision and ensuring the sustainable strategies and dramatic vertical greenery were realized in the final construction. 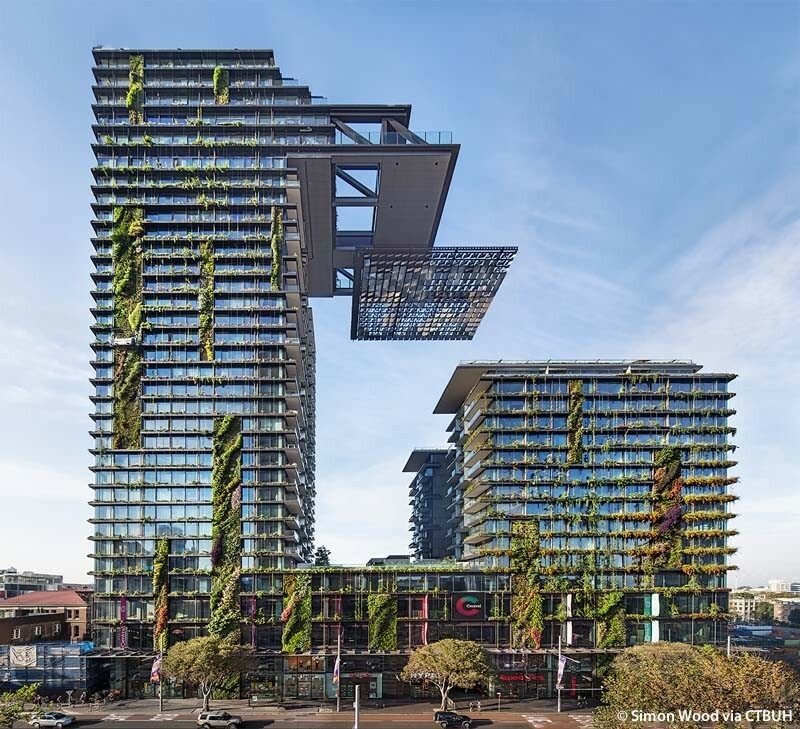 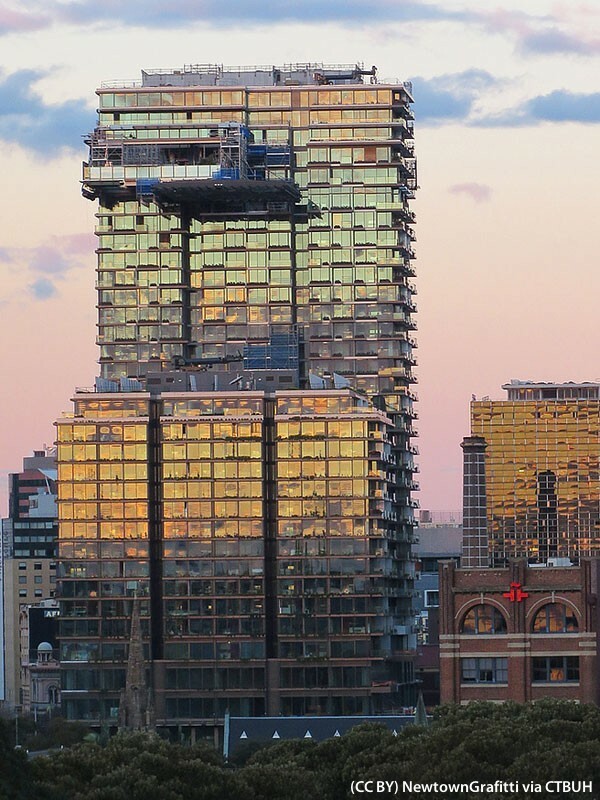 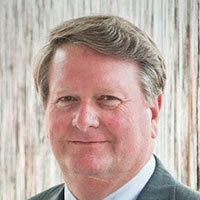 Mark Giles, Senior Associate, PTW Architects, gave more insight to the architectural design of the One Central Park building, and in particular emphasized the sizable team effort required to execute the complex project. 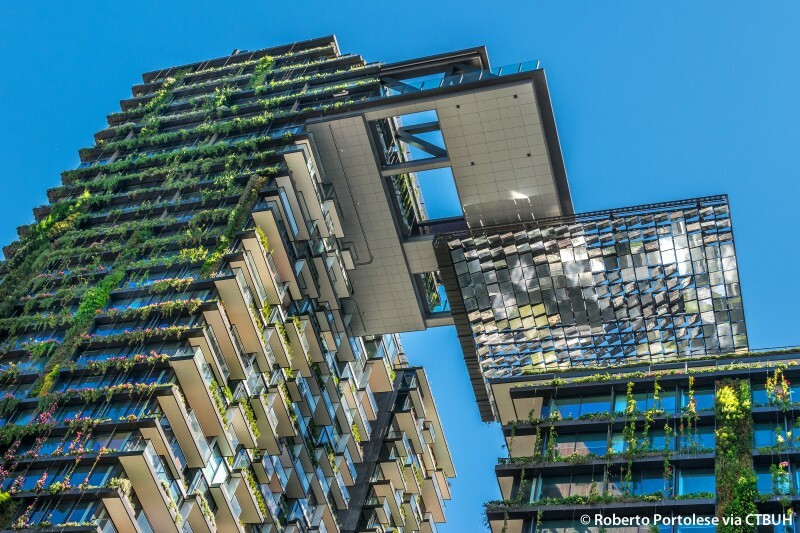 Robert Saidman, Principal, Arup, provided a technical perspective on some of the building’s key features, including the design and construction of the massive cantilevered heliostat, water recycling/treatment system, and district tri-generation plant. 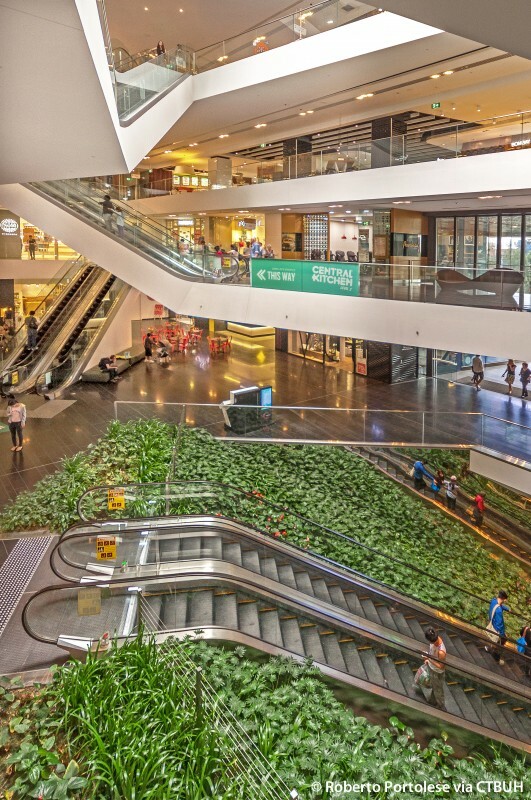 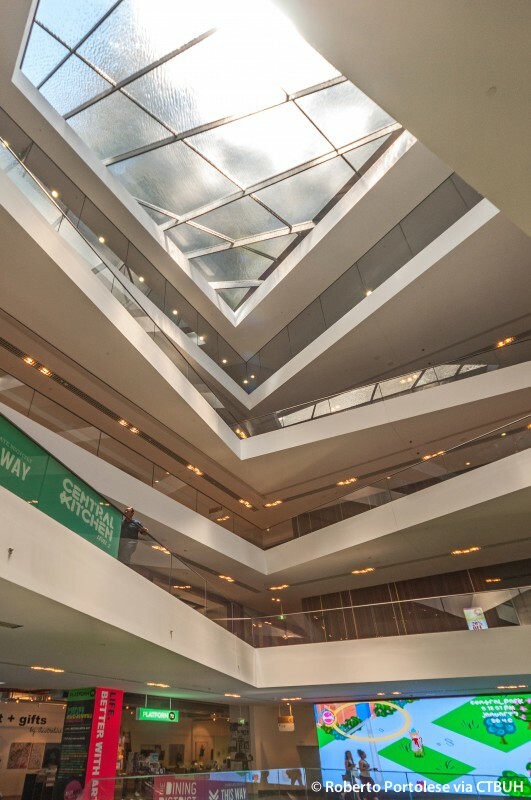 Following the presentations, the group took the escalators down through the center of the retail mall, looking up at the massive atrium ceiling with views to the overhanging heliostat outside. 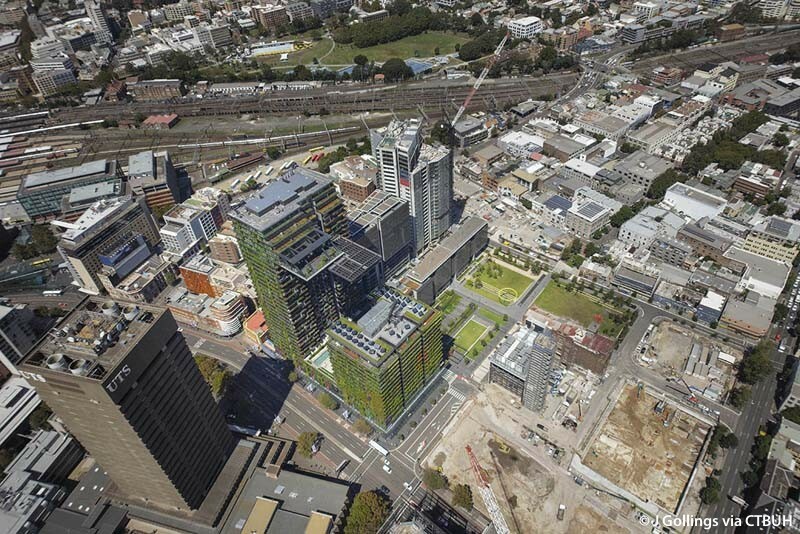 During a quick stop at the building office, the group viewed a huge precinct model of the full development (some of which is still currently under construction). 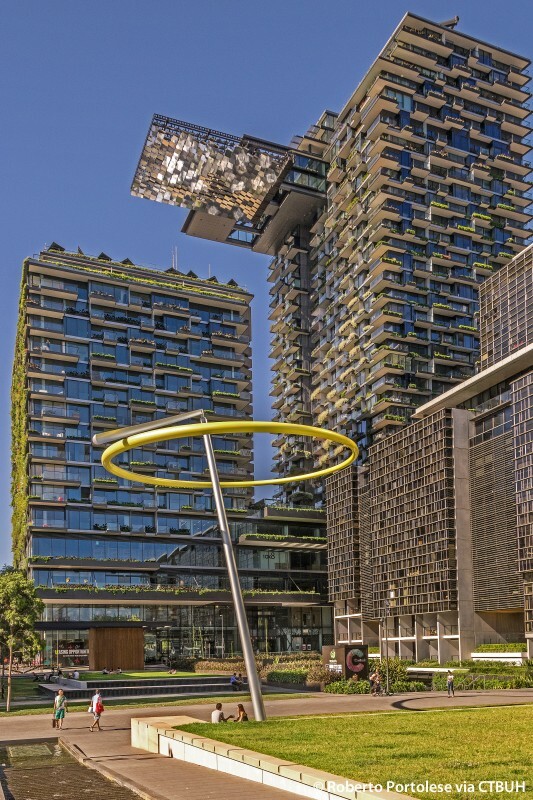 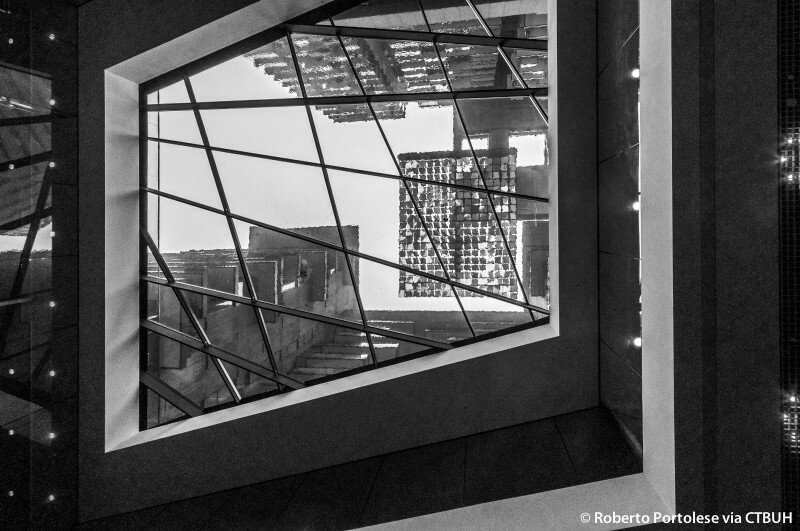 The tour then exited the building and walked across the street to Central Park, where Goldrick, who led the tour, pointed out several of the other buildings in the development that had just been seen in the model. 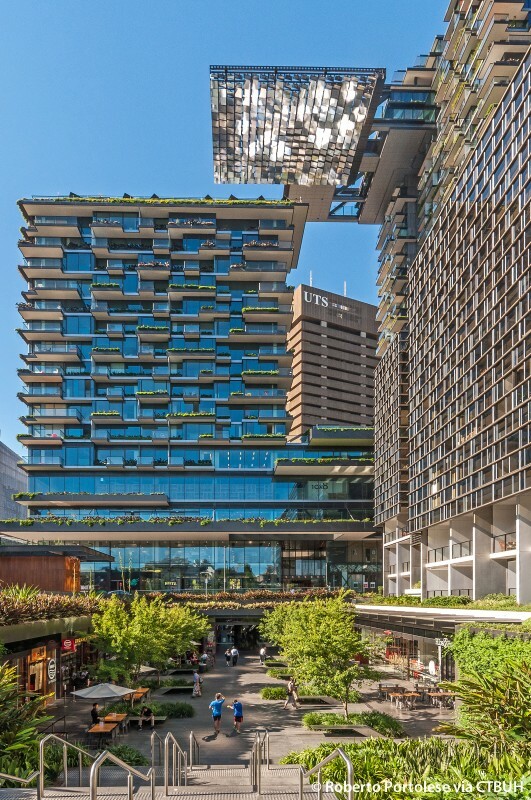 The tour cut through a small retail laneway and through a boutique hotel lobby (all part of the larger Central Park development). 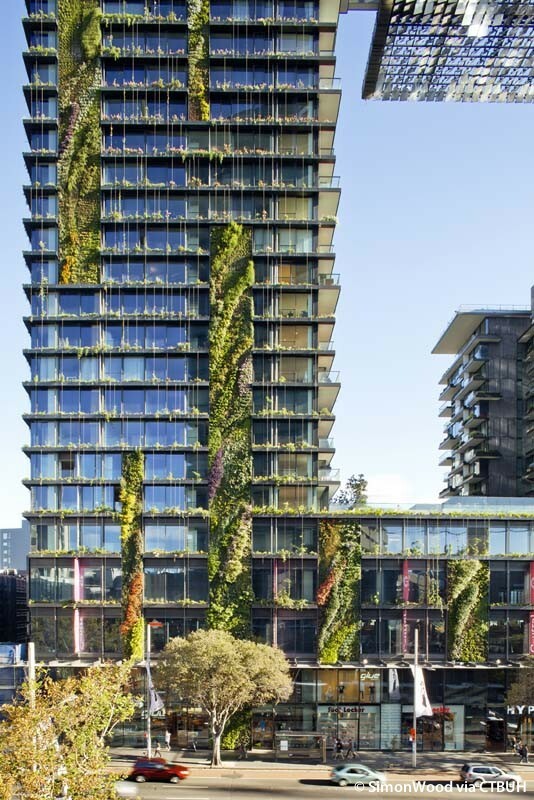 Upon exiting, the dramatic full-height greenery of OCP’s east façade was revealed. 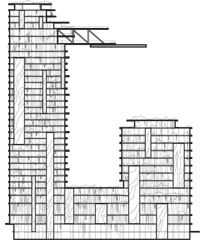 The group entered the residential lobby and took elevators to the 29th floor to the private cantilevered Skydeck. 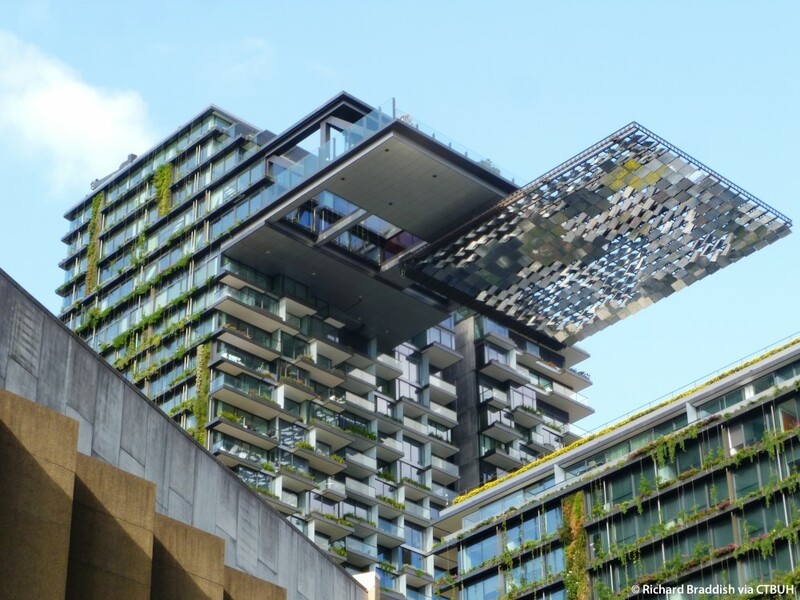 Attendees soaked in the views of surrounding Sydney and looked down on the heliostat, which cantilevered even further beyond the Skydeck just below. 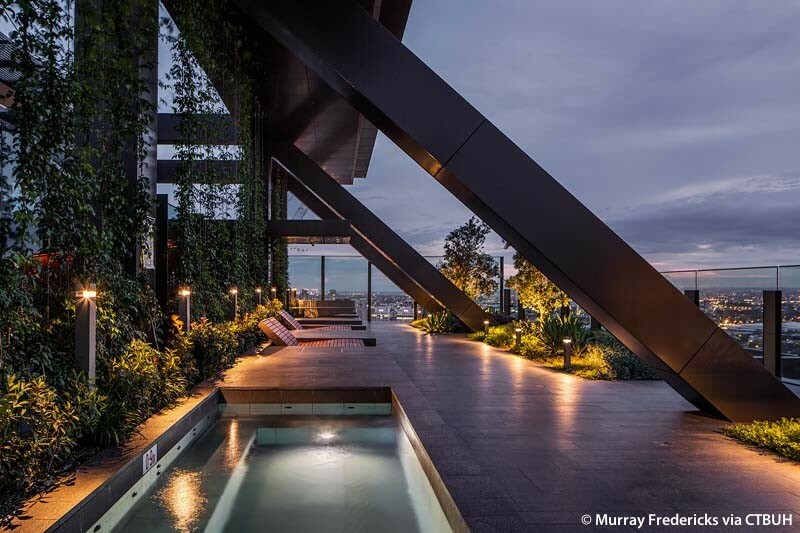 Participants learned that this private terrace is only accessible to the residents on the top six floors of the building. 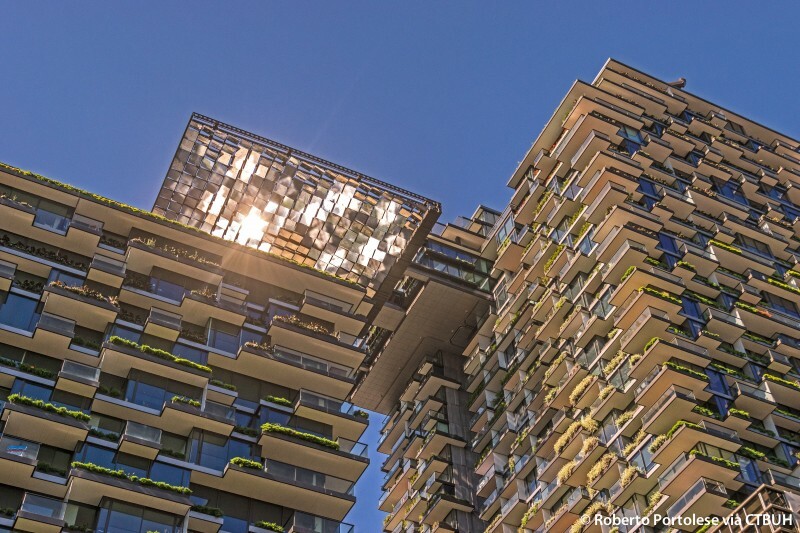 The tour concluded back on the ground level, where one of the green walls extends to the sidewalk level, offering a close-up view of how the heliostat-and-mirror system works.